international politics from the margin | Dr Stephen Hurt, Reader in IR, Oxford Brookes University, UK. Last week the UK government published its Trade Bill, which formally starts the process of moving towards an independent trade policy. Member states of the European Union (EU) are part of a customs union. This means they operate a unified trade policy, which includes common external tariffs on imports from outside the EU. The UK government has already made it clear it intends to leave the customs union as part of the Brexit process. Prior to the start of the legislative process, the Department for International Trade published a Trade White Paper on 9 October 2017, which set out the principles guiding the UK’s future trade policy. This included numerous references to stakeholder engagement and as part of a consultation exercise it included an invitation for submissions on all aspects of the developing approach set out in the White Paper. In this post I outline the major points of my submission to this consultation process. The deadline was Monday 6 November 2017 and it was therefore with some surprise that I discovered the following morning that the government was publishing its Trade Bill in parliament. This led to criticism from trade unions and NGOs who had also contributed to the consultation. For example, War on Want argued that given the timing of the publication of the bill it was clear that ‘the input of thousands of responses from members of the public could not have been considered’. Given my long-standing research interest in the EU’s trade and development policy to African, Caribbean and Pacific (ACP) states, my response focused in the main on the fourth of the five principles outlined in the White Paper, namely ‘supporting developing countries to reduce poverty’. In doing so, I also explored some of the tensions between this ambition and the other four principles (‘trade that is transparent and inclusive’, ‘supporting a rules-based global trading environment’, ‘boosting our trade relationships’ and ‘ensuring a level playing field’). My criticism of the White Paper ultimately rests on some of the problematic assumptions it makes about the relationship between trade and development. These assumptions were also demonstrated in an important speech made by Liam Fox, the Secretary of State for International Trade, in Manchester on 29 September 2016, where he suggested that ‘free trade is often a ladder to the top’. A similar claim was made by former International Development Secretary, Priti Patel, in her speech at the Conservative Party conference on 3 October 2017, when she boldly claimed that ‘trade, investment and free markets provide the route out of poverty’. These claims are advanced in the first half of the White Paper where the role of trade in the global economy is discussed. The conclusion one is supposed to draw from this is that free trade was at the heart of the historical development of the British economy and hence this is something that should be recommended to developing countries today. However, as respected economist Ha-Joon Chang has convincingly demonstrated, Britain employed tariffs for a significant period before it was able to adopt a regime of free trade during the nineteenth century. Chang notes that ‘the overall liberalization of the British economy … of which trade liberalization was just a part, was a highly controlled affair overseen by the state, and not achieved through a laissez-faire approach’ (Ha-Joon Chang, Kicking Away the Ladder, p.24). Hence, what the White Paper suggests are protectionist measures (such as subsidies for domestic industry) could conversely be understood as legitimate development strategies. The section of the White Paper on UK trade policy and how it can support developing countries includes a commitment that as the UK leaves the EU it ‘will maintain current access for the world’s Least Developed Countries (LDCs) to UK markets and aim to maintain preferential access of other (non-LDC) developing countries’ (p.32). This is to be welcomed. However, the aim of replicating the EU’s existing Economic Partnership Agreements (EPAs) is much more problematic. It is clear to anyone who has followed the EU’s negotiation of EPAs with ACP countries, that they met significant resistance from both many ACP governments, and civil society organisations (CSOs) across Europe and regions within the ACP. In part, their concerns relate directly to the assumptions noted above about the ‘policy space’ needed for development. Both the Tanzanian and Nigerian governments have indicated that they are concerned that signing an EPA will undermine their ability to adopt government policies to support industrialization. In Nigeria, the Manufacturers Association of Nigeria has been particularly effective in lobbying against the EPA, arguing that it will harm the domestic industrial sector. Moreover, they have also voiced concerns over attempts by the EU to introduce the so-called ‘Singapore Issues’ (competition policy, transparency in government procurement, equal treatment for foreign investors, and trade facilitation measures) that were rejected at the World Trade Organisation (WTO) in 2003 at the Cancún Ministerial. There is therefore a potential conflict of principles in the White Paper between the expressed concern for developing countries and the suggestion that the ‘UK will look to secure greater access to overseas markets for UK goods exports as well as push for greater liberalisation of global services, investment and procurement markets’ (p.27). These are precisely the issues that African states and CSOs have identified as problematic because they would constrain the ability of ACP states to seek to diversify their exports and support the development of an industrial sector. The White Paper’s strong support for the conclusion of the Trade in Services Agreement (TiSA) also undermines the claim to be supporting developing countries. TiSA has emerged as a separate arrangement after talks on services stalled within the WTO due to resistance from developing countries. They have expressed concerns that it would allow transnational corporations to turn essential public services into commodities that can be traded. It is therefore highly likely that the UK will meet significant resistance if it seeks to simply replicate EPAs. African states have been able to demonstrate significant agency in the EPA negotiations and there would be greater scope for this in negotiations with the UK. They have made it clear that rather than deep and comprehensive trade liberalisation, what they want is a gradual process of engagement with global markets, which if it is to be developmental, needs to be facilitated by state support. Therefore, a much better alternative would be for the UK to introduce an improved Generalised System of Preferences that goes above and beyond the EU’s current ‘Everything but Arms’ agreement with LDCs. Hence, I would support the recommendations made by Traidcraft in its February 2017 report for the adoption of ‘a preference scheme offering duty-free, quota-free market access to imports from economically vulnerable countries, including but not limited to the least developed countries’ (p.16). My final concerns relate to the democratic accountability of any future UK trade policymaking. These were reinforced by the superficial nature of the process of consultation on the White Paper itself. While it is reassuring to note in the White Paper that there is a plan for regular engagement with stakeholders, it is unclear what is meant by the phrase ‘we will ensure that Parliament, the devolved administrations, devolved legislatures, business and civil society are engaged throughout’ (p.29). Prior to this there is reference to the need for a legislative framework that allows for the quick negotiation and ratification of trade agreements. Trade negotiations are notoriously long and difficult to conclude and this desire for speed should not come at the cost of democratic accountability. As I, and 54 other academics have argued in a recent letter published in The Telegraph on 20 October 2017, modern trade agreements cover a wide range of policy areas. It is therefore vital that government makes a clear and unequivocal commitment that parliament and the devolved administrations/legislatures will have a say in both formulating negotiating mandates and ratifying any future trade agreements agreed by the UK. Moreover, information related to trade negotiations should be made public so that stakeholders are able to provide proper democratic input into the process. In recent years the electoral superiority of the ANC has begun to face its first real test since we entered the post-apartheid era in 1994. As the limitations of its neoliberal development strategy have become increasingly apparent, the question arises as to whether there is an effective leftist formation that could offer an alternative vision for the country. If so, who might constitute any such leftist formation? The answer to this question has become ever more complicated in recent years. The domestic and global political terrain has moved significantly since I first conducted some research interviews on these issues in Cape Town back in 2011. Most notably, we have witnessed the so-called ‘NUMSA moment‘ when it was felt (maybe more in hope than reality) that the left had made a real breakthrough in South Africa. After a number of false dawns in recent years, the National Union of Metalworkers of South Africa (NUMSA) has recently announced that it is planning to launch a new political party of the left. This blog post is a summary of a much longer academic article, entitled ‘What’s left of ‘the left’ in post-apartheid South Africa?’, which was recently published in the journal Capital & Class. Free access to the full article is available here until the end of this month. The article starts from the normative premise that there is an objective need for a revival and renewal of progressive forces in South Africa. It then seeks to assess the state of ‘the left’ in two complementary senses. First, it evaluates the health of a range of self-identified leftist social forces and then it passes judgement on the extent to which they can be genuinely considered ‘left’ in any meaningful sense. The overall conclusion is that at present, although there are a range of different ‘left’ actors, an effective political formation is not present in South Africa. There is some evidence of attempts at co-operation between a range of different groups. However, at present the challenge remains of how to connect these groups to the masses, which are instead engaged in localised protest and struggle that lacks co-ordination, direction and leadership. The first half of the article, sets out what I call ‘the realities of post-apartheid South Africa’. What was clear from the research I did for this project is that those who self-identify as part of ‘the left’ in South Africa all tend to agree on what the central problems are: poverty, inequality and unemployment. Far less of a consensus is apparent on what the obstacles are to overcoming these challenges. While members of the South African Communist Party (SACP), who hold key positions in the government, argue that a shift in the growth path engendered by changes in government policy will address these concerns, others in the left outside of the Alliance, see the continued hegemony of the ANC as the main concern. In this section of the article, I highlight in particular the persistently high level of unemployment, how the top 10% of the population continue to enjoy more than a 50% share of total income, and how the trajectory of the post-apartheid economy continues to rely on finance, mining and retail, whilst the industrial sector has become even less significant since 1994. These realities have endured during a period when the ANC government has, despite the numerous new macroeconomic policy launches, pursued a consistently neoliberal strategy ever since it adopted the Growth, Employment and Redistribution (GEAR) plan in 1996. In 2010 with the adoption of the New Growth Path (NGP) it did appear that maybe a change of direction was afoot. However, as I argue in the paper, there remain significant continuities in approach and moreover, the NGP has been largely superseded by the National Development Plan, which was published by the government in 2012. The left within the tripartite alliance. Here I assess all three partners within the Alliance: the ANC, the SACP and the Congress of South African Trade Unions (COSATU). Of these, COSATU has represented a more leftist stance compared to its Alliance partners. However, it is constrained by its strategic political alliance with the ANC and SACP. As a result, COSATU has evolved from an organisation that pursued wider social transformation (social movement unionism) to one that increasingly prioritises collective bargaining within the parameters prescribed by post-apartheid labour legislation (political unionism). NUMSA (South Africa’s largest trade union) has been aware of such dilemmas and has long questioned the leftist credentials of the ANC government. It has now split from COSATU and is involved in the process of forming a new trade union federation. These developments may result in a more influential leftist formation that is independent of the ANC. However, NUMSA still tends to refer rather exclusively to the ‘organised working class’ and there seems only limited appreciation of the need to broaden its focus beyond those who are employed in the formal sector. The left outside the alliance. During the late 1990s in South Africa we began to see the emergence of what were then called ‘new social movements’. This marked a clear rupture in the South African left as a whole. Their significance lies in the fact that they operate independently of the structures of the ANC. Since the turn of the century we have also witnessed the rapid growth in so-called ‘service delivery protests’. What they demonstrate is that there is a level of resistance, however spontaneous and uncoordinated, to the neoliberal policies of the government. The formation of the Democratic Left Front (DLF) in 2011 was an attempt at coordination. The split of NUMSA from COSATU then culminated in the announcement on 2 March 2014 of plans for the formation of a broader leftist movement known as the ‘United Front and Movement for Socialism’. Ultimately it remains to be seen whether the impetus given to the United Front by NUMSA, will allow it to more effectively realise the kinds of linkages envisaged by the DLF. The remnants of a revolutionary socialist left. A number of small groups in South Africa are still following a revolutionary socialist agenda. The political position of these groups remains based on a complete rejection of reformism of any kind. As a result, most of these groups eschew working with organisations that fall within the other two categories of the left. While a new left project in South Africa clearly needs to offer an alternative to the largely rhetorical stance adopted by the ANC and SACP, given the failures of vanguardism, it also needs to adopt a strategy that is likely to attract widespread support. The article concludes by noting that the dangers of the continued absence of an effective leftist mass movement are clear. These are most evident in the populist politics of Julius Malema, leader of the Economic Freedom Fighters (EFF), a new political party formed in 2013. Malema skilfully uses leftist rhetoric in speaking to precisely those people in society, the young and underemployed, who remain marginalised and disconnected from current leftist formations in South Africa. In sum, I argue that efforts should be continued in the task of co-ordinating leftist formations outside of the Alliance. However this alone, without clear links to the mass base, will not lead to meaningful socioeconomic progress for the majority of South Africans. Towards the end of the negotiated transition to democracy in South Africa, Nelson Mandela famously said ‘if the ANC does to you what the apartheid government did to you, then you must do to the ANC what you did to the apartheid government’. This quote was recently employed by Mmusi Maimane the current leader of the Democratic Alliance (DA), South Africa’s main opposition party, during his speech at the DA’s final rally before local elections, which were held recently on 3 August. The results of these elections indicate that an increasing number of South Africans are putting Mandela’s words into practice, despite the repeated assertion by Jacob Zuma (the current President) that the ANC will rule ‘until Jesus comes back’. The 2016 vote resulted in a national picture that saw the ANC’s share of the vote fall by 8%, in comparison to the last municipal elections in 2011, to a historic low of 53.9%. The DA secured 26.9% to cement their place as the leading opposition party, while the Economic Freedom Fighters, only formed in 2013, were third overall with 8.2%. Beyond these headline figures an even more challenging picture emerges for the ANC’s electoral future. A significant rural-urban divide is developing in voting patterns. Of the eight metropolitan municipalities, which include all of South Africa’s major cities, the DA held Cape Town with an impressive two-thirds of the vote and became the leading party in Nelson Mandela Bay (Port Elizabeth) and Tshwane (Pretoria). It has also gained control of Johannesburg, despite trailing the ANC in second place, because it has managed to secure the votes of the EFF and other smaller parties. Meanwhile, the ANC now only have overall control of three of the eight metros. Like many other countries in the developing world South Africa is experiencing rapid urbanisation. According to the government’s recently published Integrated Urban Development Framework 63% of South Africa’s citizens live in urban areas and this is projected to increase to over 70% by 2030. Hence, the urban vote is going to become increasingly significant in the future. It appears that the ANC’s reliance on its credentials as a liberation movement is increasingly losing currency with South African voters. This ‘liberation legacy’ is something that the ANC has relied upon in its campaign strategies for both the most recent local elections and the national poll in 2014. It is therefore unsurprising that some research conducted by a team at the University of Johannesburg, suggests that the ANC is relying increasingly on the support of older voters, whereas the two main opposition parties appeal most to younger voters. Much of the debate since the 3 August poll, both within and outside the ANC, has focused on whether the decline in support for the ANC is because of the increasingly toxic reputation of President Zuma, or whether it is a verdict on the ANC’s broader record on human development. South Africa continues to face the triple challenge of a very high unemployment rate, rising income inequality and persistent levels of poverty. It appears that the initial debriefing within the ANC’s national executive committee refuses to accept either explanation. Any suggestion that the blame rests with Zuma is certainly not being made public and in fact the conclusion seems to be simply that some ANC voters stayed at home and that all the party needs to do is address their concerns. In fact, the turnout in the most recent poll was 58%, which is consistent with the figure for the previous local elections held in 2011. Many analysts (e.g. Justice Malala) have celebrated the outcome of the recent municipal elections arguing that they are good for democracy in South Africa. It is certainly the case, from a procedural point of view at least, that having a less dominant ANC may well result in a more accountable ruling class. However, given the development challenges faced by South Africa, I would argue that what is most necessary is an effective leftist political programme. As a recent Afrorbarometer poll suggests, a majority of South African citizens would be in favour of the creation of a new workers’ party. The EFF are at present the only effective electoral force offering something resembling such a programme, however, in reality they offer a populist blend of African nationalism and class-based politics. After the local elections the EFF faced the dilemma of being a potential kingmaker in a number of municipalities. It declared it would not enter into any formal coalition with either the ANC or the DA but it did decide to vote to support the DA’s candidate for mayor in Johannesburg. Given how orthodox the DA’s economic policies are, this is a decision that is remarkably inconsistent with the EFF’s radical leftist rhetoric. 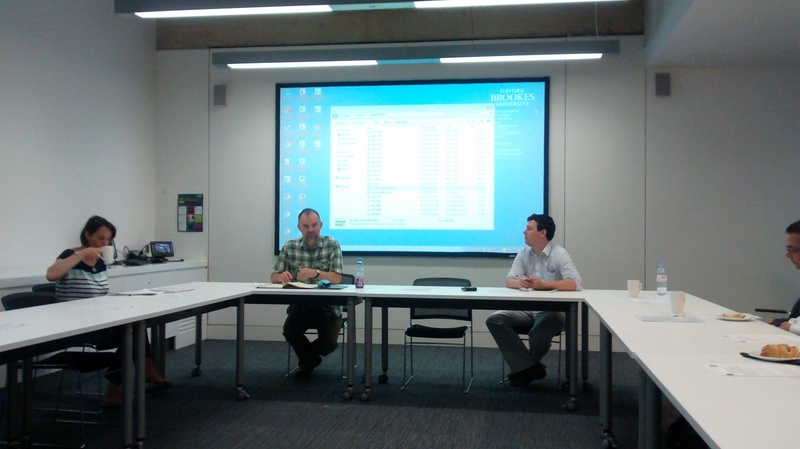 Earlier this month saw the sixth meeting of the ESRC seminar series on UK-Africa relations that I have been involved in. Two workshops hosted by the Royal African Society were followed by a public lecture in the evening. The overall theme for the day being ‘Africa and the UK Public Imagination’. In this post I will provide a short summary of the various presentations and sketch out what, for me at least, were some of the most interesting issues raised. Podcasts of the workshop presentations will be available on the website for the seminar series in due course. During the morning workshop, our speakers considered how Africa is represented within campaigning traditions in the UK. Niheer Dasandi (University College London) reported on some research he had conducted with colleagues on the nature of Africa campaigning in the UK. Based on survey data, the emotional responses of individuals were assessed in relation to the use of what Dasandi described as ‘traditional’ and ‘alternative’ appeals to the public. The conclusion being that NGOs do have alternatives to the stereotypical negative imagery that has dominated Africa campaigning for years. Nick Dearden (Director of Global Justice Now) picked up on these issues and unpacked some of the broader political dynamics at play. 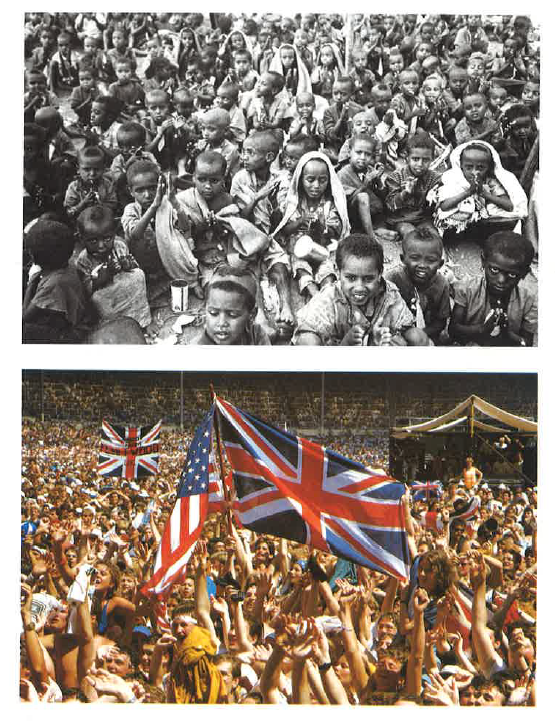 He convincingly argued how the ‘live aid model’ continues to be the dominant framing of Africa experienced by the public in the UK. He spoke from personal experience of the problems faced by NGOs in framing their campaigns on Africa. In particular, he argued that the use of ‘traditional’ imagery results in a depoliticisation of the challenges facing Africa and a focus on aid as the appropriate response, rather than broader campaigns on justice. The limits to engendering a spirit of solidarity in campaigning on Africa, was then discussed in Lara Pawson’s very personal account of her experience of living and working in Angola. Pawson is the author of In the Name of the People: Angola’s Forgotten Massacre. She reflected on how hard it is for those of us in the UK to show real solidarity from afar and argued that more space should be given to Africans themselves. Our afternoon workshop switched attention to how UK-Africa relations have been reflective of changing political dynamics at home. Allison Coyle and Sara Rich Dorman (both University of Edinburgh) outlined how the Scottish government has supported bilateral relations between Scotland and Malawi. This development partnership receives government funding to support the activities of civil society organisations who are at the heart of the relationship. They noted, that partly for reasons of scale, this results in a much more ‘grounded’ development partnership than the UK-wide approach led by the Department for International Development. Dyfan Powel (University of Aberystwyth) then discussed the ‘Wales for Africa‘ programme, which is chiefly a grant administration scheme to support Welsh NGOs and their work in Africa. Both the Scottish and Welsh cases demonstrated how, partly for reasons of size and in the Welsh case in particular, as a result of the constitutional constraints upon the Welsh government, the underlying politics of development in Africa are not explicitly considered. Finally, Andrew Mycock (University of Huddersfield) in his discussion of the Commonwealth demonstrated how UK perceptions of Africa are still shaped by the historical legacies of colonialism. In the evening we relocated to the School of Oriental and African Studies to hear Alex de Waal (Tufts University) give an overview of a new book he has edited entitled Advocacy in Conflict. This spoke to some of the themes discussed earlier in the day. A convincing case was made as to how transnational advocacy can often slide into over-simplified singular narratives that limit the agency of Africans themselves. As always, it was an enjoyable and thought-provoking day. On further reflection, I found a couple of themes to be of particular interest. It was clear from the discussions on Africa campaigning that context is important. As Nick Dearden acknowledged, during New Labour’s time in office there was, relatively speaking, a more conducive environment to challenging the dominant historical framing of Africa. However, the public’s perception is hard to shift because of the broader context and in particular the power of the mainstream media, which is dominated by the culture of celebrity. This was picked up in Alex de Waal’s evening lecture where he critiqued what he termed the ‘designer activists’ who can play a key role in agenda-setting. The seminar series as a whole has demonstrated how difficult it is to disaggregate the UK’s relations with Africa from a whole range of multilateral fora (be it the EU’s trade agreements with the continent, or the role of the Commonwealth, etc.). However, at the same time, the process of devolution has seen moves towards the constituent parts of the UK forming their own ‘independent’ relations with Africa. These are limited both in terms of the amount of funding available and the scope for them to offer a political alternative to the orthodoxy of mainstream NGOs. Later this year, the series of seminars will conclude in Nairobi, Kenya where questions of ‘African agency’ will be considered in relation to the overall theme of ‘UK-Africa Relations’. My blog posts on previous seminars are all available here and for full details of the series go to the official website. For the latest news do follow @UKAfricaSeminar on twitter. 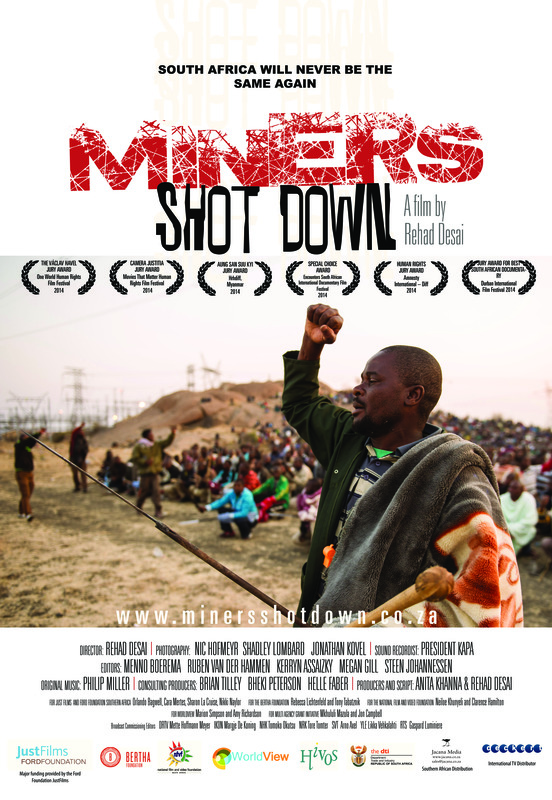 Miners Shot Down covers the week from 10th-16th August, 2012 and not just the final denouement, part of which was witnessed on news broadcasts around the world. In doing so, it provides important details surrounding the escalation of events during that week but it is also explicit in linking what happened at Marikana to the broader historical and political context. One of the central questions raised by the film is whether the then Minister of Police, Nkosinathi Mthethwa, was asked to authorise the approach taken by the SAPS, not least the deployment of 648 police on the 16th August and the order for 4,000 rounds of live ammunition and four vans from the local mortuary. The film starts with the horrific images of 16th August 2012 and reminds us of how similar they look to those witnessed during the apartheid era at Sharpeville in 1960 and Soweto in 1976. The National Police Commissioner, Riah Phiyega, is then shown in the initial aftermath suggesting that the police had acted in self-defence. The rest of the film compellingly seeks to undermine such a claim as it recounts the events in chronological fashion. As you watch things unfold during that fateful week in August three years ago, you get a strong sense of inevitability of what is to come. For me this is one of the key messages of the film. The massacre feels so absolutely inevitable, not only of course because we are watching the film, already primed with the knowledge of what is to come, but also because of the way the demands of the workers appear to have been handled from the outset. It documents how Lonmin management repeatedly refused to negotiate with the rock drillers over their demands for a rise in wages and how the National Union of Mineworkers (NUM) refused to support their members. Cyril Ramaphosa, interviewed for the film, is portrayed as emblematic of the way that elites in the ruling ANC and business have become so close. Rampahosa who is currently Deputy President of the country, was once a leader of the NUM during the apartheid era, but at the time of the massacre was a board member of Lonmin. Ramaphosa refuses to say anything of any real substance on camera, arguing that if he does it might prejudice his involvement in the commission of inquiry. This is not surprising given that it transpires that he sent an email on the day before the massacre encouraging government ministers to increase the police presence in order to quash the strike. The sheer brutality of the events of the 16th August 2012 make for decidedly uncomfortable viewing. The film highlights how 17 of the 34 workers killed on that day were shot after the initial barrage of fire that was captured by TV news teams. A number of witnesses have testified that many of these were shot whilst trying to surrender. The impunity with which the police appeared to operate is captured towards the end of the film in a brief, but chilling scene where SAPS officers are seen to be bragging about how they shot one of the mine workers and how his ‘muti’ (traditional medicine) won’t help him. Since the film was released, the Farlam commission of inquiry’s report into the events at Marikana has finally been published. However, many of the questions raised in Desai’s documentary remain unanswered. Decision-makers including the Minister of Police have not been held to account and instead the focus is on the inappropriate ‘tactics’ adopted by the SAPS. The Farlam commission merely recommends that a further inquiry is conducted into whether Riah Phiyega is adequately equipped to hold office. The film does a good job of giving a voice to some of the Lonmin workers involved. It is clear that underlying their grievance over their rates of pay, are deep frustrations at the way the economic system in South Africa has, for them at least, continued unchanged during the post-apartheid era. The overarching message of Desai’s documentary is that the ANC government in South Africa is working in the interests of transnational capital and not the workers. To many observers this has been clear for some time, but the events at Marikana, which are depicted so graphically in this film, reinforce this conclusion in such a deeply disturbing fashion.